Men’s ‘Aly’ logo wallet from Parisian label A.P.C. Crafted with smooth, vegetable-tanned Spanish leather, the brown cardholder comprises a bi-fold design which opens to reveal a full-length note compartment, two slip pockets and multiple card slots. 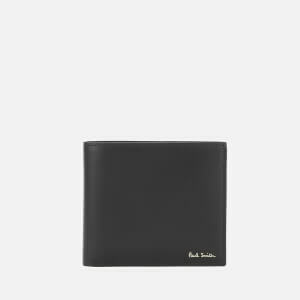 Lined with a soft cotton blend, the wallet boasts tonal stitching and is completed with embossed branding to the exterior. Main: Calfskin Leather. Lining: Textile. Dimensions: H: 9.5cm x W: 11cm.